Agudath Israel of America was chosen by the U.S. Department of Education as this year’s “association spotlight” at its National Private School Leadership Conference. Hosted by the Office of Non Public Education (ONPE), the annual conference brings together more than 100 private school leaders from around the country. Agudah’s executive vice president Rabbi Chaim Dovid Zwiebel offered brief remarks and showcased a new video, Ashes to Renewal: Agudath Israel and the Growth of Jewish Education in America. In his remarks, Rabbi Zwiebel gave a brief outline of the history of Agudath Israel and its current activities on behalf of Jewish day school and yeshiva families across the country. While the video highlighted the growth of the Orthodox Jewish community and its network of schools, Rabbi Zwiebel spoke about the challenges facing Jewish schools including the high cost of tuition, protecting schools from heavy-handed government intrusion, remaining faithful to the schools’ religious mission in an increasingly secular society, and the challenge of harnessing technology. Other conference speakers included U.S. Secretary of Education Betsy DeVos, who challenged the private school community to rethink education. 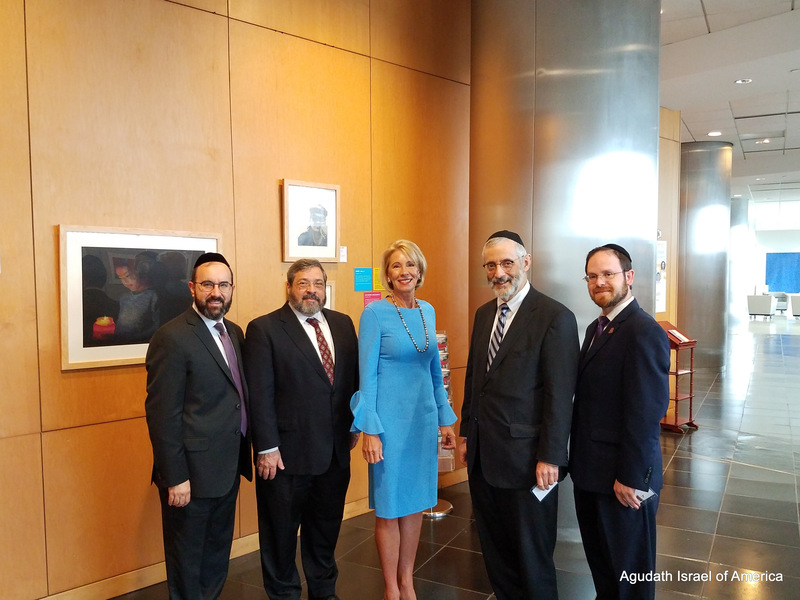 Secretary DeVos reiterated the administration’s support for school choice, and encouraged supporters to “stay tuned.” Following her remarks, Agudath Israel’s delegation had the opportunity to personally thank Secretary DeVos for her friendship and leadership. Agudah attendees at this year’s event included Rabbi Zwiebel, vice president for government affairs Rabbi Abba Cohen, national director of state relations Rabbi A.D. Motzen, director of Agudath Israel’s Mid Atlantic Region Rabbi Ariel Sadwin, and Rabbi Ami Bazov, coordinator of education affairs. The event concluded with a reception celebrating ONPE’s 40th anniversary. ONPE plays a critical role in helping the private school community interact with the US Department of Education. Rabbi Cohen meets regularly with the Office of Non Public Education and other divisions of the Department of Education on a wide range of issues including special education, equitable services, religious accommodations, and higher education.